Air Lift RideControl adjustable air spring kits are a great solution to beef up the ride quality on your vehicle. Air Lift RideControl air springs provide up to 2000 pounds of leveling capacity and work with your existing suspension to give your vehicle more leveling support when you need it. Proper weight distribution translates to improved safety as well as a more comfortable ride. Air Lift RideControl Air Springs fit between your leaf spring and the frame of the vehicle to provide improved suspension support. To operate your Ride Control System, simply add air (anywhere from 5-100psi) to the air springs if you are carrying a heavy load to ensure that your vehicle remains level and stable. When you're done towing or hauling, simply deflate the RideControl air springs. The air spring pressure is controlled through air line tubing that connects to the most convenient spot on your vehicle�s chassis. Improved Steering and Improved Braking: When all four tires are firmly on the ground, braking ability and steering ability both improve. Reduced Sway: Air Lift Ride Control Air springs increase your spring rate and vastly improve the stability of your vehicle. Less (if any) Bottoming Out: Air Lift Ride Control Air spring kits provide adjustable load support. You'll keep your vehicle from sagging, which helps prevent bottoming out on rough roads. Proper Headlight Aim: Only level vehicles provide safe and proper headlight aiming. When your rear end is sagging, your headlights point up, which reduces down road visibility. Less "Porposing": Even vehicles that don�t squat when loaded sometimes "porpoise" vertically when towing heavy loads. Installing your new Air Lift Ride Control Adjustable air springs dramatically reduces this problem for a safer, more comfortable ride. 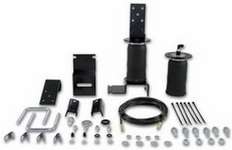 Your Air Lift RideControl Kit will come with everything you need. It includes 2 air springs, brackets, air lines, Schrader valve detailed instructions and all required hardware. The part number for this item is 59531 and it fits 1994-2004 Chevy S-10 S-15 4WD (Models w/out Track Bars) models.